Can collaborative art practice be a method for HCI research? Since 2013, I have been working with diverse multimedia artists, experimental musicians, and HCI researchers to produce hybrid objects that are at once collaborative forms of art production and exploratory sites in which questions core to the field are addressed in playful, suggestive, or speculative way. 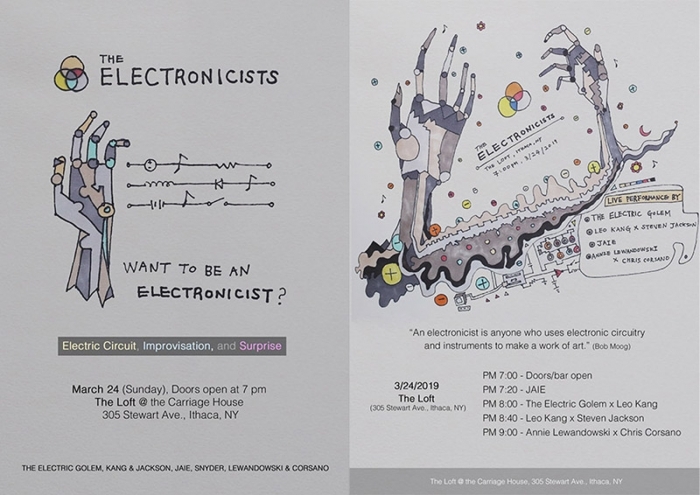 So with a nod and wink to Robert Moog, we give you the electronicists – humble workers in light and sound who mess with, move, and mash up electrons. Like Moog and his contemporaries (and the myriad electronicists who have gone before), electronicists cross boundaries: digital and analogue, materiality and idea, instrument and machine. They cook with light and sound – tasting this, bending that, until the mix and blend feels right. Working in studios and rehearsal, hardware, and code, they suggest new ways of drawing together the sonic, the visual, and the haptic. They are committed to experiment, improvisation, learning, and surprise. While humans are involved, the electrons are the stars of the show – and on any given day, the electrons may flow differently. Experimental, ordinary, inclusive, and engaged. We invite you too to be an electronicist. Or perhaps you already are? - from its invitation. Intermodulation is an art-research project that explores improvisational activity as both topic and tool of multidisciplinary HCI inquiry. 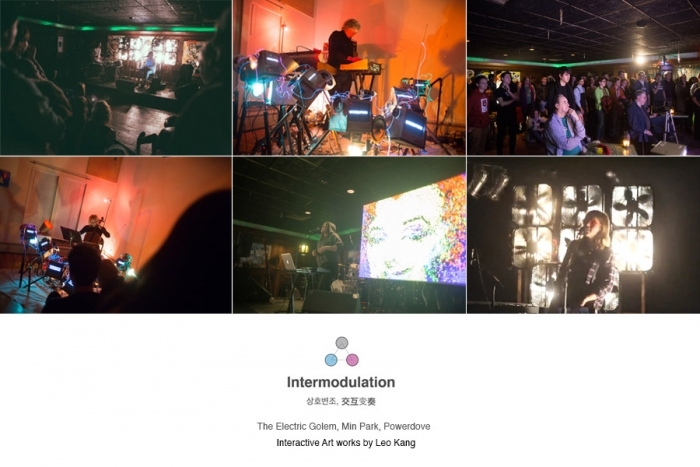 For the collaborative art work, we have collaborated with three groups of musician (The Electric Golem, Min Park, Powerdove) to produce diverse audio-visual concerts in NY, US since 2015. The experience of these participations has been deliberately captured and studied through a general auto-ethnography approach with an extensive process of documentation and reflection, captured through a rich combination of cameras, video, audio recording, and field notes. Scale is an interactive art project created from the detritus of broken and discarded technologies. These things live all around us - the toaster that toasts on one side, lost media devices with no known source of content, the objects left over as we leap from world to world to world. Sidelined by age, wear, and context, these objects speak to the secret history of our love affair with machines, and the quiet relations of maintenance and fixing, care and loss that may persist after the passion subsides. Infrastructure without content, content without infrastructure: by weight, by volume, by history, we live in a broken world. Our work gathers and explores these objects, seeking new sites of imagination, hope and empathy. As participants enter the site, they find strange and messy piles of broken, dark and silent objects, fronted by an old digital scale under a single spotlight. When the audience steps on the scale, the scene comes to life: digital clocks race through an accelerating series of times, old radios pick up random signals in their environment, electric calculators compute random numbers, and variably cracked and restored screens display text drawn and distorted from web-based environments. Step off the scale, and the scene returns to silence. But in this moment, we are reminded: our objects remain alive, filled with mysteries and secret languages, neglected talents and strange beauties. How can we relate to this secret society of things? What values and qualities can we find in them (and in ourselves)? And what might they teach us about fear and wonder, imagination and care, love and belonging in the mixed world of humans and objects?